BMW makes a lot of different motorcycle models and they all have different characteristics. Some have a traditional handlebar and some do not. A lot of them have large mirrors with a stem. Some have an accessible fork stem hole. Some do not. These are all common places to mount a cell phone, camera or GPS. As mentioned in other articles on this topic, motorcycle owners like to mount things on their bikes. The most popular items mounted are cell phones and GPS units. I also see some that mount cameras, satellite radios and even drinks. While the most popular mount for motorcycles is the handlebar, that is not necessarily the case for a BMW motorcycle because on some models handlebar real estate is scarce if there is any at all. I receive a few questions regularly regarding the potential use of a suction cup on a motorcycle on places like the gas tank which I do not recommend as the vibrations can easily compromise the effectiveness of the hold of a suction cup so please avoid these types of mounts. Let’s discuss some mounts for BMW motorcycles. If you have some handlebar real estate available, that’s the most popular place to mount a device. The RAM Motorcycle Handlebar Mount with X-Grip Cradle is an excellent choice that we have recommended continuously over the years for holding a cell phone. Made of metal, the u-bolt fits handlebars to 1.25 inches diameter and the X-Grip cradle opens to 3.25 inches meaning most phones with or without a case or skin will fit well. The cradle pivots and swivels at the base and cradle and your phone can rotate into landscape or portrait. The cradle comes with a safety tether which is a very nice touch. The mount comes with a lifetime warranty from the manufacturer. A similar mount but with a camera tripod bolt is the RAM Motorcycle Handlebar Mount with Camera Adapter. It’s the same u-bolt base and 3″ arm as the phone mount we just talked about except you get a camera adapter. The adapter has a 1/4″ – 20 threaded screw that’s common to tripods and perfect for almost any action camera. Your camera can fully swivel at the adapter to virtually any angle. The 2.5″ round support base is an added feature that comes in handy for heavier cameras. The mirror stem is another popular place to mount your device. Add the RAM Mirror Stem Base to the mount we just mentioned. The part can replace your current mirror or the mirror stem can be inserted through the 11mm hole of the base. This part has a one inch ball that would fit into the arm from the handlebar mount or you can purchase a RAM arm and X-Grip cradle to add to the mirror stem. A company called TechMount is one of the few that makes a BMW Control Mount System that is specific to this manufacturer. It mounts onto the handlebar control pinch bolts on the clutch or brake side (K1600 GT clutch side only). The mounting kit comes with replacement bolts and the wrench needed to install the mount. Made of metal, this kit has a 17mm ball at the end which ironically is the same size used by a Garmin Nuvi GPS cradle. So for many GPS units, this might be all that is required. If you would like to add a universal phone cradle to this mount, there are many options. I’m a big fan of the TechMount Techgripper Phone and GPS Cradle. it’s one of the stronger universal cradles I have seen and opens to 4.3 inches. The back of the Techgripper cradle has a 17mm round socket on the back. That socket fits over the 17mm ball on the mount. This cradle is good for phones that have a camera on the back near the middle of the phone because it won’t be blocked by the minimal size of this cradle. 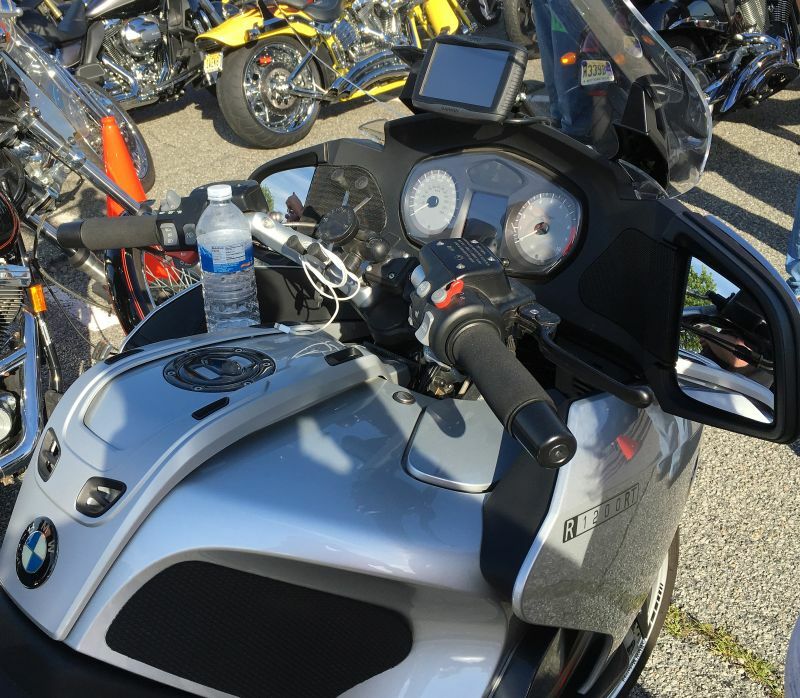 These three locations: the handlebar, mirror stem and control mount are three of the most popular places when it comes to BMW motorcycle mounts. We concentrates on two manufacturers that are well-known for their motorcycle mounts. Both RAM and TechMount have been around a long time, make their mounts in the USA and offer great warranties with their products.